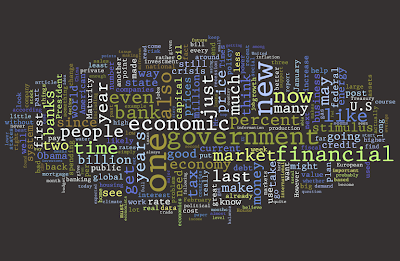 This is a word cloud from all economics blog postings in the last week. I'll be generating this every week so please subscribe using the links on the right if you'd like to be notified each time it is published. It has been constructed from a list of economics RSS feeds mainly generated from the Palgrave Econolog, and uses Wordle to generate the image, the ROME RSS reader to read the RSS feeds, and Java software from Inon to process the data. Thanks to an anonymous poster on an economics blog somewhere for the idea. Unfortunately I haven't been able to find the original reference but if anyone can remind me who was asking for this within the last month or so, please let me know.